Schweinshaxe, or tender and juicy pork knuckle wrapped in a salty and roasted-crisp skin, is a recipe for a quintessential Oktoberfest feast. It makes for the perfect pairing with a big stein of your favorite beer. Schweinshaxe (pronounced SH-vines-HAKS-eh), is a German dish particularly popular in Bavaria, the home of Oktoberfest. That alone is enough to make it an Oktoberfest staple. Add in the fact that it’s a combination of tender, juicy pork and crispy, salty skin. You have yourself Oktoberfest pairing heaven. What Is a Pork Knuckle? 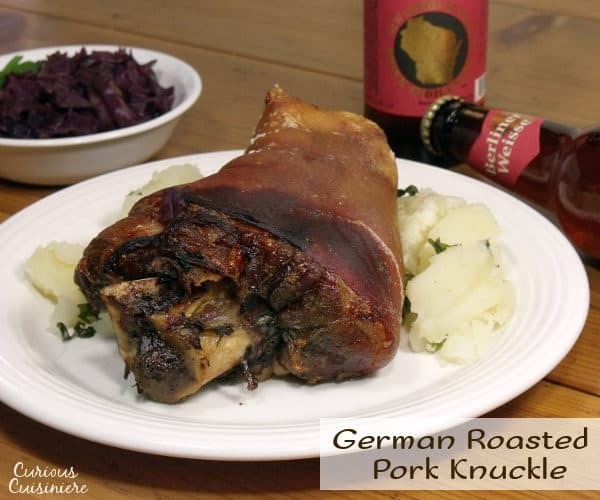 Schweinshaxe starts with a cut of pork you’re probably not too familiar with: the knuckle. Yes, pigs have knuckles too. While pork knuckle might sound a bit unappealing, Schweinshaxe, now that just sounds like a fun culinary feat to master. The bone-in hunk of pork leg is quite impressive, I’m not going to lie. But it can be a bit intimidating. Even though each pork knuckle is only enough to feed one person, it just doesn’t look like anything that you would typically venture to cook. 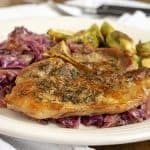 You’ll probably find pork knuckles in your grocery store’s meat section labeled as a “pork hock”. Hock or knuckle, you’re getting the part of the pig that is the joint between the foot and shank. It’s a stubby piece of meat, covered in a layer of skin and fat. And, while there isn’t a lot of meat on each hock (knuckle), there is a TON of skin. Once rubbed in salt and roasted, this skin gets super crispy and delicious. So, delicious, it has its own name. It’s known as crackling, and it’s pretty much the main reason for diving into a pork knuckle. As far as cooking goes, the process could not be any more simple. First, you rub the hock with a garlic clove and salt. The seasoned knuckle gets placed into a baking dish filled with sliced onions and beer. Then, you pop it in the oven and forget about it for 3 hours, while the oven’s heat works its magic. Or, you can try to forget about it. 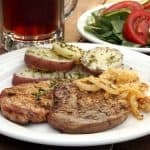 Because, let’s face it, as the aroma of beer, onions, and roasted pork fills your kitchen, there will be little else you can think of. By the time the oven’s buzzer rings, the excitement for that crispy pork skin is barely containable. Just don’t forget to pour yourself a big stein of beer before chowing down. 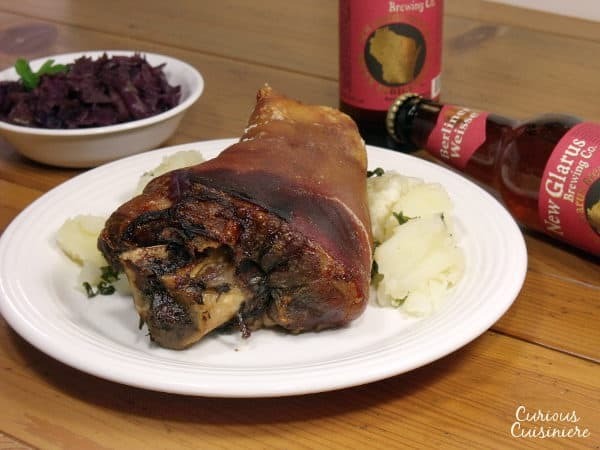 What Beer To Serve With Pork Knuckle? Honestly, any full flavored (preferably German) beer will do for pairing with this juicy, tender, fall-apart meat and crunchy, salty skin. With a crystal-clear pale-golden hue filling the glass and a beautiful white frothy head forming, New Glarus’ Berliner Weisse is a treat to the eye; and the tongue. Bringing the glass to your mouth, you are welcomed with aromas of lemon, citrus and a touch of wheat. This beer cleanses the palate beautifully, goes down easily, and the light effervescence cuts through the fatty flavors of the juicy pork. If you don’t happen to be in Wisconsin, don’t worry, just look for Gose beer (pronounced GOSE-uh), sour beer, or any other Berliner Weisse. If you’re cooking a pork knuckle, you may as well go all out! Serve your Schweinhaxe the Bavarian way with potato dumplings, spaetzel, or boiled potatoes and red cabbage or sauerkraut. 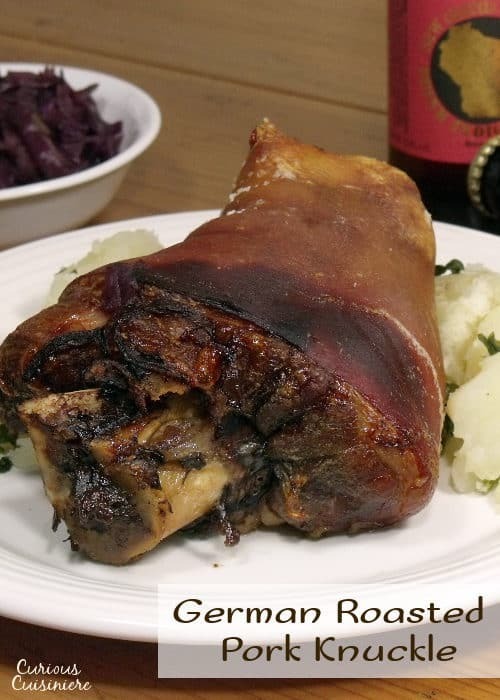 Schweinshaxe, or tender and juicy pork knuckle wrapped in a salty and roasted-crisp skin, is the quintessential Oktoberfest feast, perfect for pairing with a big stein of your favorite beer. Place the sliced onions in the bottom of a 8x8 baking dish. Rub the skin of each pork hock with half of a garlic clove. After rubbing, add the garlic to the onions in the baking dish. Rub roughly 1/2 Tbsp of salt into the skin of each pork hock. 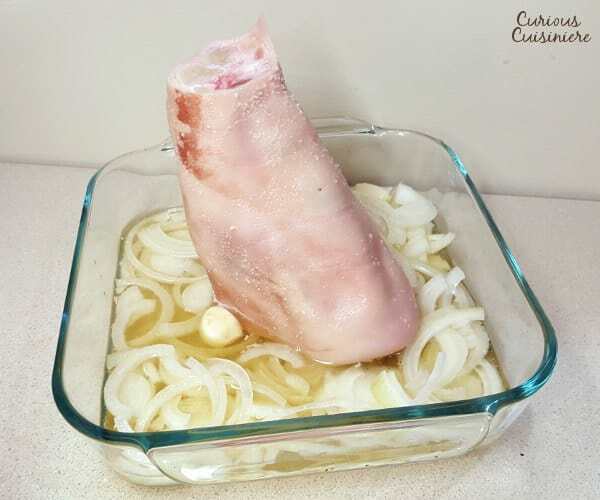 Nestle the hocks, meaty side down, in the onions. Pour the beer around the hocks. Each hock is traditionally served individually, with a fork and sharp knife, but most people find it easier to enjoy the crisp skin by just digging in with their hands. If you are only cooking one knuckle how long do you cook it for? Hi Neolleen. We would cook one hock for 2.5 – 3 hours, making sure to check to be sure there is always moisture in the bottom of the pan. The cooking time insures you get a nice, crispy outside and the moisture in the pan helps the meat not to dry out. I’ve made this twice…sort of.. The first time, I followed the recipe to the letter except for the beer type, because all I had on hand was an IPA. Ate it with poached sleighbell potatoes. Rich as hell. Pretty tasty. The second time was yesterday. My foodstore had pork hocks skinned and sliced 1-1/2 inches thick for osso bucco on special, so I grabbed a poverty pack of them on a whim. Used an artisanal pilsener, reduced the temperature to 325°F, and topped each slice with about a third of a clove of crushed garlic, but otherwise did as you instructed. Served it up with wild rice and green peas. Pilsener to wash it down. Best supper I’ve ever cooked for myself, and I’ve been cooking for 45 years. 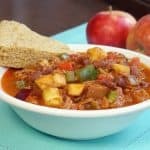 So glad you’re enjoying this recipe! 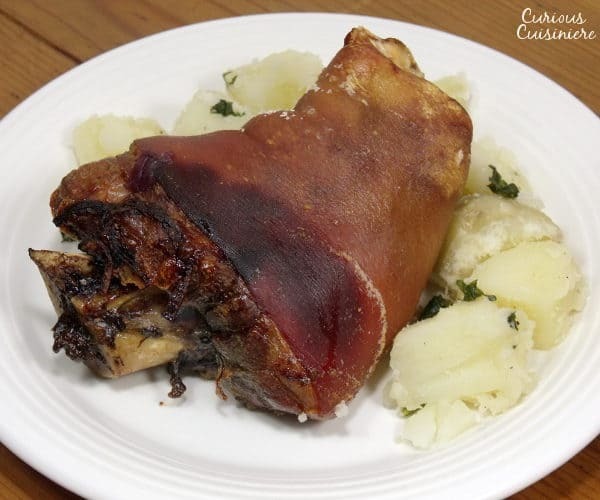 If we ever see pork hocks sliced for osso bucco, we’ll have to give it a try that way! Just got back from Oktoberfest in Munich. While your recipe might turn out a similar product, that is not how the Germans make Schweinshaze. They are roasted on spits with a nut others, which may include chickens, rotating near a vertical explosion bed of hot charcoal. Yum. Thanks for your insight Mark! That does sound quite tasty! 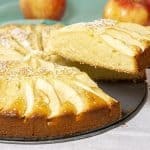 Do you have to cover the pan while baking? No, you don’t. Your goal is to roast the pork and get a nice crispy skin. Enjoy! I made this dish with 2 (huge) haxen I got from D’Artagnan and cooked for 3.5 hours because of the size of the shanks.. The skin was nice and crisp and the meat fell right off the bone. Served it with knodeln (dumplings) and red cabbage. Delicious! Thanks so much for a real Oktoberfest treat! So glad you enjoyed them Suzanne! Sounds like you had some delicious sides to round out the meal! My brother-in-law sent me your recipe. He bought me an instant pot and we make family meals when we get together. He thinks this recipe would work in the pressure cooker. Any thoughts? Particularly how long to pressure cook, and how do we get the skin “crisp”? Hi Randy. We’re not too familiar with instant pot pressure cooking. A quick look online, and I see some recommendations for around 30 minutes at high pressure. You definitely won’t get the crispy skin with the instant pot. You’ll probably want to transfer it to a baking sheet after it has cooked, rub the skin with oil, and broil it in the oven. The skin is pretty thick, so I’m honestly not sure how well this method will work for the skin, the outer parts may char before the whole skin gets properly crisped, so I’d watch it carefully and possibly turn it as parts seem to be crisping. If you do give it a try, definitely stop back by to let us know how it turned out for you! 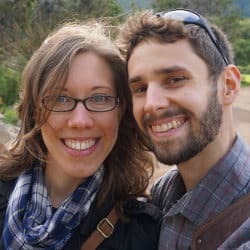 I’m sure other readers would love to hear your experience. You can also cure the knuckle first, which will make it even more tender and tasty. Make a brine with 10% salt to water (so say 40g salt to 400ml water); ideally you want the weight of meat to brine 3:1. 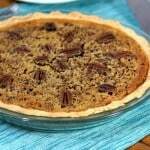 You can add pepper or spices or garlic etc as desired (caraway is a traditional one, juniper berry, bay leaf, etc are nice). Stick the knuckle in the brine sealed in a couple freezer bags and leave in the fridge for two days or three. Then follow the same recipe, just make sure the knuckle skin is dried off when you roast it. This sounds wonderful! We’ll have to give it a try! We hope our recipe comes close to what you remember! Do you still salt the skin after brining ? Hi Lea, Pork should be cooked to an internal temp of 145F. So I would use that and the color of your crust as a guide. Enjoy! We are in an isolated area of northern Minnesota but fortunate to have Berkshire pork available. 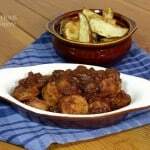 We cooked hocks using the recipe and they were divine. We made Modernist egg noodles with caraway and served Polonaise sauerkraut. Dessert – cloaked apples. I have a melt-in-your-mouth recipe for pork hock that turns out with skin so soft it can be cut with a fork, and the meat fully permeated with the marinade. 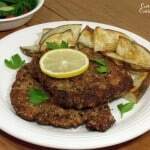 While in Dresden I had the soft skin version and it was remarkably similar to my recipe. 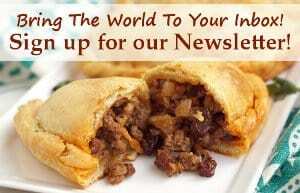 why use kosher salt when cooking pork? 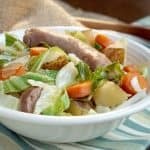 We typically use Kosher salt for this recipe because it is a coarser grain which works best in this case. I think she means course salt. All salt can be labeled Kosher as there is nothing the Rabbi does to make salt Kosher. False and true. The name is confusing, but “kosher salt” is coarse, pure, salt. You use it for koshering meat, where iodine and such are neither helpful nor permitted, and dextrose is *right out*. This was amazing, and I lived in Bavaria and sampled some brilliant dishes there. It was so good, and so simple that I’m making it again tonight. It’s going to become a monthly staple! We used the leftovers to make pork tacos with pickled red cabbage, kraut, avacado, tomatoes and hot sauce. Also amazing! Xo and high five! Wonderful! We’re so glad you enjoyed the pork knuckle Jessica! Your pork tacos sound incredible too! What a great way to use the leftovers! Thanks Geo. We hope you enjoy it!